We recently sat down and spoke with Cellarmaster Mike Perreira, who will be aboard Celebrity Reflection. He was happy to answer all of our wine-related questions. Q: What activities take place during the Riedel tastings? What makes it a great program to participate in? A: The Riedel tasting is an incredible wine experience. Participants are guided through an itinerary that plays to all of the senses, each of which is engaged when enjoying wine: sight, touch, smell, taste and hearing. The seminar begins with the 250-year history of the Riedel family, highlighting their deep roots in, and connection to, glassmaking, as well as their incredible passion for it. Further on, participants in the seminar will enjoy four grape varietals, drinking them from an assortment of different glasses. These steps truly show what a great impact a specifically designed varietal glass has on the taste and aroma of the wine. By being the first in the wine industry to discover that the size and the shape of the glass influences the taste and aroma of the wine, Riedel has the privilege to introduce participants to a first-hand experience and take their wine appreciation to a different level. It’s a great seminar, as you’ll never approach a glass of wine in the same way again. Q: What are the highlights of the various wine packages available onboard? A: The various wine packages available onboard offer guests the opportunity to enjoy a great, worry-free wine selection that our Cellarmaster put together to match various tastes. The wine packages also offer a great value when compared to the regular wine list price for the same wines individually. Wines can be enjoyed in many locations onboard, and the various forms of the Classic and Premium packages are tailored to suit shorter or longer itineraries. We even offer a “Build Your Own” wine package, where guests can create their own package (range of $75 and above per bottle). Q: What are the best wines that Celebrity offers? A: The best wines that we offer come from the major wine regions in the world. The winemakers that we host on our crafted wine lists are boutique wineries, renowned chateaux, or signature brand names. We also try to offer a great selection of the destination wines, so our guests can enjoy a taste of the places that they are visiting while still being onboard. Some of our wine highlights are ones from Super Tuscany, Burgundy, and Bordeaux – and, of course, the leading Cabernet Sauvignon from California - Screaming Eagle. Q: Where did you develop your love of wine? A: Coming from a country where the hospitality business flourished, fine dining and wine are an inevitable part of it. My passion for wine started the moment I stepped aboard one of the Celebrity ships 15 years ago, and this love is still growing. I developed a true commitment to treat our guests as gold, and knowing, understanding and appreciating wine was an important chapter. And now, through our vast array of wine events, we try to help our guests develop a greater appreciation for wine, as well. Q: Where did you train? A: All of my training and development came from a lot of seminars, training sessions, and winery visits sponsored by Celebrity Cruises. Q: What are some surprises about wine that cruisers might not expect? A: Onboard, we have some wine treasures that will be appreciated by wine lovers from around the world. We host classic grape varieties, along with some lesser known varieties that will capture the attention of passionate wine lovers and get those excited who would like to try something new. Another surprise for our long-time guests may be the wine-by-the-glass program. We’ve enlarged its selection, and it now offers the opportunity to taste different wines and change the selection of the wine during each dinner course. Another great surprise is our Wine Bar – the Cellar Masters, where wine lovers or guests that would like to discover more things about wine, on their own, have a great wine treat. Fantastic selections are constantly changing and there’s an abundant tapas menu to complement their picks. Q: What is your favorite flavor profile and pairing? A: When it comes to food and wine pairings, there is such a broad spectrum of choices that it would be hard to name just one. Among them are the fantastic pairings of a goat cheese soufflé with white Bordeaux, or the outstanding match of blue cheese (the cheese board selection in Murano) and dessert wine, like Klein Constantia or even Sauternes. Q: What is the meaning of the wine tower? What does it symbolize? A: The wine tower is a wonderful architectural piece that emphasizes the great commitment of Celebrity Cruises toward delivering a fantastic wine experience, as well as an outstanding food selection in our restaurants. Being the central piece of the dining room, it draws the attention of our guests to wine as an important part of the dining experience. You can see it from anywhere in the Main Restaurant and its bubble motif symbolizes Champagne and the Champagne wine region. Q: Is there an order to the wine arrangement in the tower? A: The arrangement in the tower is done by grape varieties. All of the pinot noirs that are from Burgundy/France, Oregon, and New Zealand, for example, will stay together, making them easily identifiable during busy service hours. The very high-end wines, on the other hand, have a separate section and encompass different grape varieties. Guests visiting the tower have the opportunity to see what a large variety of wines we accommodate onboard. Q: So, how many selections of wine do we have onboard? A: With the latest wine list from all countries, we have a total of 487 different labels. We’re the only cruise line in the world with such a vast selection of wines from all different appellations. Q: What are the greatest challenges to managing the guest wine experience? A: The greatest challenge is accommodating guests who request what they consume back home, which sometimes is not available on our wine list. Of course, we are always there to assist with a suggestion for something similar. It takes a lot of professionalism and great communication skills to convince those guests to try something new and different. However, when some of our guests discover a wine that they like (after a sommelier recommends it to them), they stick with that particular one. Q: What is your recommendation for cruisers to select the best wines for their dining experience? 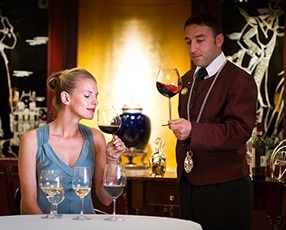 A: All of our guests need to have full confidence in our certified sommeliers who will guide them to try new wines and help them expand their comfort zone. Explain to the sommelier what wines you like, so that they can recommend something similar. Trust their taste and knowledge, and open yourself up to try new grape varieties. Look for food and wine paring recommendations either in the menu, or ones expressed by your sommelier.